How to chop and crush garlic is a key cooking skill as garlic is another great workhorse of the kitchen and gives great flavour. Here, we show how to chop garlic and how to crush garlic. Firstly, peel away the outer thin, papery skin from the garlic bulb. Place it onto the chopping board (root up) and press down firmly with the palm of your hand. This should loosen and separate the cloves. Take as many cloves as you require and store the remainder in a cool, dry place, but not in the fridge, as the odour may be quite strong and could taint foods such as butter and milk. To chop garlic, top and tail the garlic clove and place it on the board. Gently press down on the garlic clove using the flat side of the knife. The skin should now be easily removed. Cut the garlic clove as you would for an onion small dice or finely sliced. In some cases, the garlic clove can be left whole. In many recipes the garlic will need to be crushed – many say that the smaller you crush garlic, the stronger the flavour will be. You may wish to use a garlic press, but you can often get more of the garlic clove left inside the press than what comes out. Plus, the press is awkward to wash up afterwards! It is often quicker and easier to crush garlic on a chopping board using a knife. Lay the garlic clove onto the board, place the flat side of your knife on top and press firmly down on the garlic. This should roughly crush the garlic clove. If you wish to make the crushed garlic into a smooth garlic paste, sprinkle a tiny amount of salt onto the crushed garlic (this stops it from slipping) and, with your knife at an angle, press down firmly rocking the blade back and forth. In a short while you will have a smooth garlic paste. Use the knife to scrape the garlic paste off the board. 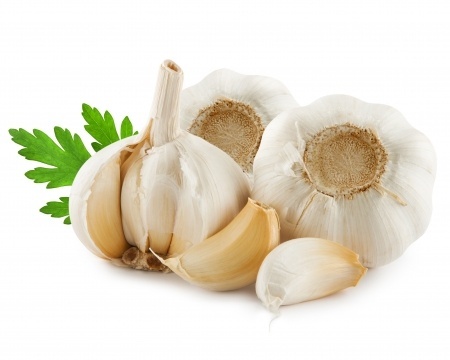 If, when using garlic, you have any reaction on your skin, wear thin disposable gloves. Now that you have seen all there is to crushing and chopping garlic, why not try these great tasting recipes that use garlic, to test your new cookery skills?